Women have many choices when it comes to taking proper care of their hair. 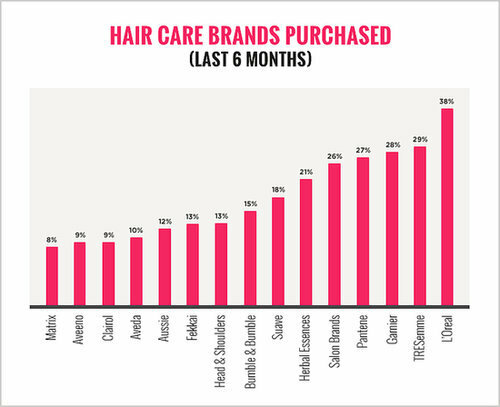 As part of the POPSUGAR Insights Q2 2014 beauty study, we asked women to tell us which brands within the hair care category they have heard of and which brands they've purchased in the past six months. Here are the results. 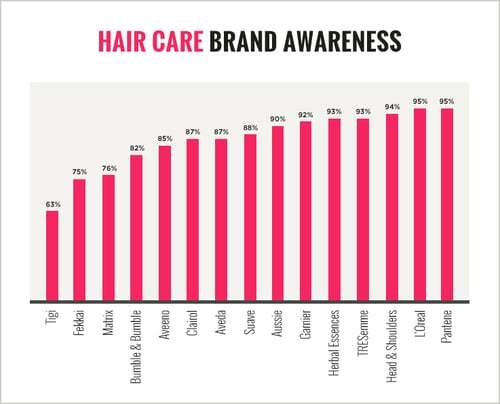 Pantene and L'Oréal are the hair care brands that have the highest total awareness, and, in total, seven brands enjoy over 90% awareness. Sixty-three percent of the brands we measured were known by over 80% of women in the survey. L'Oréal is not only a brand with high awareness in the category, but it is also the brand that was purchased by the highest percentage of women in our study. Overall, 38% of women had purchased a L'Oréal hair care products in the past six months. Other brands that ranked highly in terms of female purchase behavior included TRESemmé (29%), Garnier (28%), and Pantene (27%). All four of the most purchased brands also enjoyed awareness levels of 92% or above, whereas other high-awareness brands like Herbal Essences and Head & Shoulders ranked ninth and sixth in terms of purchase respectively.